Goodreads says, "Luce would die for Daniel. And she has. Over and over again. Throughout time, Luce and Daniel have found each other, only to be painfully torn apart: Luce dead, Daniel left broken and alone. But perhaps it doesn’t need to be that way. . . . Luce is certain that something—or someone—in a past life can help her in her present one. So she begins the most important journey of this lifetime . . . going back eternities to witness firsthand her romances with Daniel . . . and finally unlock the key to making their love last. Cam and the legions of angels and Outcasts are desperate to catch Luce, but none are as frantic as Daniel. He chases Luce through their shared pasts, terrified of what might happen if she rewrites history. Because their romance for the ages could go up in flames . . . forever." Luce goes back in time in order to see what her past lives have been like with Daniel as she is not one hundred percent sure about their love based on the ending in book two (Torment). Luce is trying to figure out how to break the curse, except this isn't a leisurely trip down memory lane as Cam, the Outcasts, Daniel, and other angels are hot on her trail. The problem with time travel is the fact that if Luce makes any changes to her past lives, it could have serious consequences in the future, like a ripple effect. This is what worries Daniel the most as a small change could impact their futures greatly. 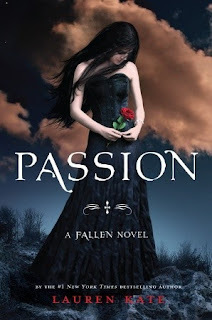 Passion, Lauren Kate's third book in the Fallen series is an edge of your seat adventure into Luce's past. Luce is taking things into her own hands (finally!) in Passion, which I really liked. She was trying to figure things out on her own without relying on Daniel or Miles or any one else. She travels back and witnesses her former lives which take place all over the world and throughout many points in time. I especially liked this part since I am big fan of time travel and historical fiction. I found this aspect of the book to be extremely fascinating as well as the idea of reincarnation. However, while I liked this part of the book, after a while I felt the time travel got to be monotonous as this was the main focus of the novel. I think it had to be done this way though in order for readers to fully comprehend Luce and Daniel's relationship; however, I wanted a little more of present day. There's a new character, Bill, whom Luce meets while traveling back to her past lives. At first he was a strange new addition to the plot, but his secrets will be fully revealed as Passion progresses. Readers can count on many new secrets being uncovered and a few plot twists while learning more about Luce and Daniel's eternal love. The final book in the series, Rapture, comes out in 2012. Passion felt like a middle of the road book that is hopefully setting readers up for an epic ending. Word on the street is that Disney snatched up the movie rights to all four books in this series. Daniel on the big screen? Yes, please! Middle books are usually hard books to really get into since you're learning so much new stuff but get little resolution. I love that Luce is starting to be more independent though, that was one of my main issues with her in Fallen. Awesome review Christina! This is my absolute favourite book of the series, but you know I am a sucker for 'soulmates through the ages' stuff! Can't wait to see how it all ends for Luce and Daniel in Rapture! Jenny- I know, right? You are right though...she is more independent! Thanks for visiting. Mrs. Q- I hope you find time to read Fallen! I wish there were more hours in the day, too! Thanks for stopping by! Leanna- I know you are! :) haha. I can't wait to see how it ends...hopefully well! Thanks for visiting.